wendy house » Blog Archive » stop it! This scribble was published on Friday, July 5th, 2013. You can follow any banter on this scribble with the RSS 2.0 feed. You can share your inspired musings after typing the anti spam word near the bottom of the page. But no Pinging because its too naughty. 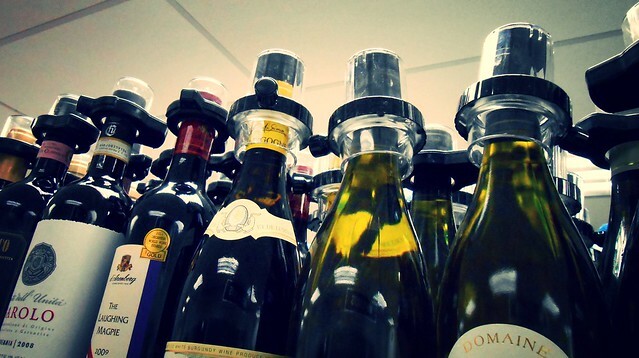 Anti-theft tags to stop shoplifters pocketing bottles of wine, I think – with the shape of a wine bottle, there are few options for attaching such a tag, so crimping it round the neck seems common. Presumably it does also stop people “sampling” bottles and escaping with the contents, leaving the empty behind, or tampering, but I imagine those are secondary at most.